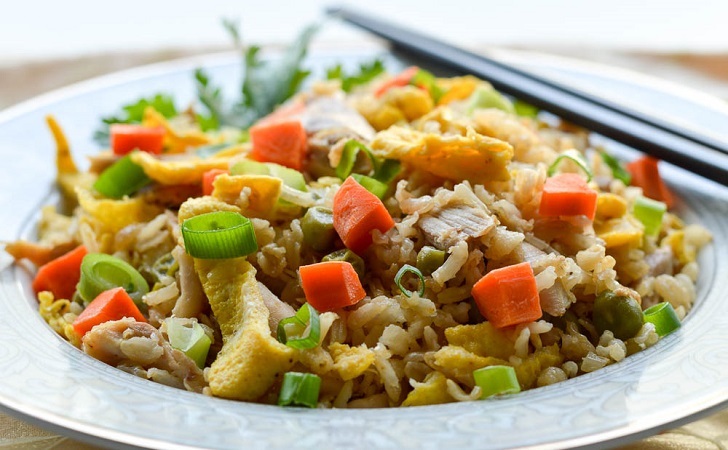 We love chicken fried rice at our house and wait for the leftover night. The weekly meals often consist of at least one curry meal and rice dinner, and another roast chicken night. So, naturally, it makes sense to combine any leftovers into a quick and tasty combo. Make your favorite take-out dish at home, you will undoubtedly use less salt, sauce, and oil. Plus, you are more likely to pick quality ingredients and avoid added “flavor-packets” and preservatives, often used at take-out restaurants. Heat 1 tbsp of oil to coat a large frying pan. Scramble eggs in a bowl, season with black pepper to taste, add to the pan to make an omelet. Remove eggs when cooked and cut into bite-size strips and leave aside. Add another 1 tbsp of oil to the pan and warm through carrots and peas. Add in the chicken, and the rice to the same pan. Add back the eggs. Drizzle on the soy sauce, stir and taste. Adjust seasoning with more soy sauce, oil and/or pepper. Remove from heat, garnish with chopped green onions and enjoy. We hoped you enjoyed this recipe, if so, please share it on your favorite social media.